Fyodor Shalyapin... Wherever the voice of the great singer is to be heard, whatever composition he performs, it makes our heart involuntarily tremble, causes us to stop and listen to it forgetting everything. Erected in the late 18th century as a typical Moscow cottage with log walls, plastered to took like "stone", a suite of small halls, two outbuildings and a garden stretching to the Moskva-river, the house was later rebuilt time and again. When Shalyapin moved into the house it wanted repair. Being one-storey on the facade and two-storey on the inner side, the house was surrounded with branchy time-trees and maples. In 1918 after the revolution the house was nationalized and new dwellers were let in. In 1922 Fyodor Shalyapin went on a long tour abroad. The fate of the house was not very fortunate. Its residents kept changing, the house was falling into decay and delapidation finally becoming unfit for further occupancy. Such was its condition when in 1978 the Moscow Council transferred it to the possession of the Museum of Musical Culture. The complicated restoriation works lasted about eight years. The Memorial House of F.Shalyapin was inaugurated on September 23, 1988. The display of the museum is many-sided. It emphasizes three basic subjects: the House, the Creativity and the Time. The first hall shows exhibits bearing relation to Shalyapin's childhood and youth as well as his theatrical debuts in Ufa, Tiflis and Petersburg. The easel to be seen in the same room between the windows carries Shalyapin's first photograph taken in Ufa. He is a little over seventeen... The face, calm and open, is not very remarkable yet but the eyes make you feel peculiar predestination. There is something highly magnetic in the very look of young Shalyapin. Old pictures... Nadezhda Pal'chikova, Yulian Zakrzhevsky, Ivan Kiselevsky, Pyotr Medvedev, Semyon Semyonov-Samarsky... Do the names of these talented actors, directors and entrepreneurs bear any significance to us today? Does anyone remember them? Young Shalyapin having seen "Medea" and other performances at Medvedev's theatre in Kazan recollected: " The theatre drove me crazy and nearly irresponsible... "
The next section of the exhibition is dedicated to the first Petersburg period of Shalyapin's creative life (1894-1896). The photographs displayed here show the singer in the roles of Mephistopheles (" Faust " by Ch.Gounod), Don Pedro and Bertram ( "The African") and ("Roberto le Diable" by J.Meerbeer) performed at Panaev's theatre in Petersburg. The exhibit of this section tells us about Shalyapin joining the Mariinsky Theatre and making his debut as Mephistopheles. The decorative design of the first floor makes use of golden and claret colours that are reminiscent of Moscow theatrical interiors of those times. The exhibits near the entrance are dedicated to the Moscow Private Opera and its founder Sawa Mamontov. The activities of the theatre fall under three basic periods, the second one (1896-1899) being most remarkable. It was a triumph of Russian music and Russian operatic theatre. During three seasons Shalyapin sang nineteen parts at Mamontov's theatre with fifteen of them in the operas of Russian composers. It was the theatre where Shalyapin fully revealed his genius that was later admired the world over. Upon joining the theatrical life in Moscow, Shalyapin took a great interest in the creativity of the Maly Theatre coryphaei O.Sadovskaya, M.Ermolova and A.Lensky. He made friends with K.Stanislavsky and V.Nemirovich-Danchenko, the actors of the Moscow Art Theatre L.Moskvin, V.Kachalov and V.Luzhsky. The third room is decorated in turquoise colours. The exhibits in the room acquaint visitors with Shalyapin's tours abroad and his triumphal debut at the famous "Teatro alla Scala" in Milan where on March 3/16, 1901, he performed the part of Mephistopheles in A.Boito's opera of the same name. Also here is the playbill of Ch. Gounod's " Faust " shown at the theatre on February 24/March 8, 1904, with the participation of F.Shalyapin, Storchio, G.De Luca (production by F.Shalyapin, scenery design by K.Korovin, costume design by A.Golovin and G. Telyakovskaya). The easel standing nearby shows the photographs of the scenes from G.Massenet's "Don Quichotte" with Shalyapin. The first performance took place on February 6/19, 1910, in Monte Carlo; later, performances were organized in Brussels and Moscow. Visitors can see Shalyapin's sketches of the make-up and costumes of Don Quichotte. Cervantes belonged to the trio of the singer's most favourite writers equally with Pushkin and Shakespeare. The highly humane personality of "the knight of the rueful countenance " interested Shalyapin very much. He returned to this role more than once. The section dedicated to Shalyapin's creativily of 1917 through 1922 prior to going abroad (the playbills and posters of charity performances as well as the photographs of those times) gives evidence of his intensive artistic work. The exhibit of the room ends up with the drawing by P. Buchkin who imprinted Shalyapin in his new role of king Philip G.Verdi's "Don Carlos". This part performed at the Moscow Bolshoi Theatre on February 10,1817, was doomed to be the last one played in Russia. Shalyapin's Study. The photographs and portraits hanging on the walls give an account of the owner's creative connections and his friendship with men of letters, artists and musicians of those times. The central wall shows the photographs of V.Stasov and O.Petrov, as well as V.Serov's sketch of the famous portrait of Shalyapin (now kept at the Tret'yakov Gallery). The desk supports the rare photograph of Shalyapin's father, the bust of Pushkin and some letters from A.Tchekhov, V.Polenov and Vl.Doroshevich. The wall between the windows demonstrates the drawing by L.Pasternak depicting Leo Tolstoi late in his life, and Shalyapin's drawing of Don Quichotte. On the opposite side one can see the door leading into the room that belonged to Shalyapin (it is now called"The Wardrobe"). It contains the theatrical costumes of the singer who used them in his performances. Leaving the Wardrobe one can get into the small room which is now called " The Make-Up Room ". The toilet-table here shows Shalyapin's make-up accessories such as the mirror, tin can with powder, comb, make-up pencils and favourite travelling candle- sticks. On the left there is Iola's wardrobe with the large mirror. Rumour has it that Shalyapin studied the expressiveness of his posture, perfected his sense of rhythm and facial expression in front of this mirror. Also here, on the hanger, is the costume of Eryornka consisting of the sheepskin of a peasant, shirt and felt boots lined with leather. 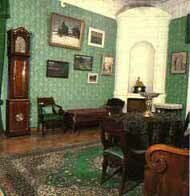 The walls are decorated with the photographs reflecting the last ye ors of the singer's life in Russia. The small wooden staircase leads from the Make-Up Room to the mezzanine. 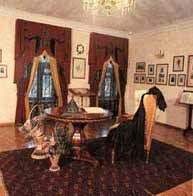 The interior of the room is preserved exactly as it was during the singer's life: the book-case with an early sculpture of Boris Shalyapin, the ottoman, the Turkoman carpet, the photographs of Shalyapin with his daughters Irina and Lidiya, the singer's drawings made in Monte Carlo on March 19, 1908, with the touching inscription "Father's drawing for Boriska to remember". The White Room. Shalyapin perfected his roles here, got ready for concerts, rehearsed parts with the famous composers, musicians and accompanists S.Rachmaninov, M.Slonov, A.Koreshchenko, D. Weissand, F.Keneman. Once Nadezhda Plevitskaya sang in this room and Fyodor Shalyapin demonstrated how to sing the Russian folk song "l remember how young I was".